Worst Disney 52: Westward Ho, The Wagons! 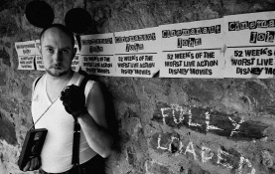 Cinemanaut John follows Disney to the frontier with Westward Ho, The Wagons! Is the film as exciting as the exclamation point in its name would suggest, or is it as monotonous as the endless prairie its protagonists traverse? We conducted year-long experiments that subject two Cinemanauts to a particular category of movie once a week for an entire year. Click here to learn more about our experiment! Can't find what you're looking for? Try our advanced search tool! We're conducting year-long experiments that subject two Cinemanauts to a particular category of movie once a week for an entire year. Click here to learn more about our experiment! This website is a parody of fair use for educational purposes only.